Your Wheel of your Equinox is used to represent a helicopter view of the segments of your life is relation to the equinox through all areas of your life as they are today. The segments are represented by the spokes of the wheel. As you move through each phase of your life, you have more options in each segment and through the decisions you take (consciously or unconsciously) the segments will become more defined. Each segment will be made up of a number of specific elements for your equinox. Click here to understand how to use your Wheel of Equinox. Please be aware that this Wheel of Equinox is an example and that you will draw your own and fill in your own segments. Once you have drawn your own Wheel of Equinox, enter onto it all your OWN areas that need your spiritual focus in your life as your life is today. Don’t enter past areas or those areas that are not in your life today or future areas that you want to bring in. 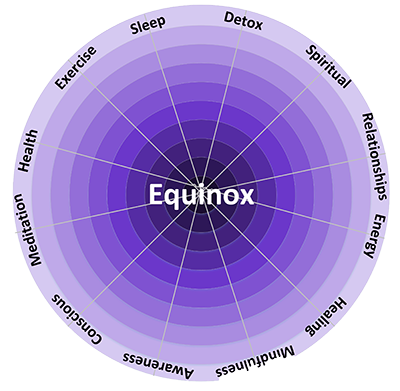 To learn more about using the Wheel of Equinox, from creating your own, through ranking your own development, to understanding and working with your results, please contact Barbara.